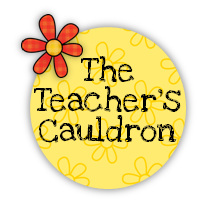 A Day in First Grade | Spider Week! 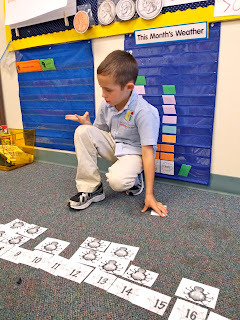 Last week we continued practicing addition with how we can form numbers. Since we were studying spiders, we just had to use our fun sparkly spider counters. And I must say these math bins were a HIT with my kids!! They loved practicing counting by 2’s, 5’s and 10’s with her spiders and were so proud of themselves when they completed the activities! We also continued working on patterns this week! Another part of Jen’s math bins were sorting addition problems by their sums! My students really loved using her ten frame and flies and help them figure out the answers! You can get these awesome math bins here– Spidey Math Center! As part of our Science Unit we jotted down everything that we new about spiders. And afterwards labeled a GIANT spider on our bulletin board. After reading a few picture books and watching the Magic School Bus Spins a Web we created our own spider webs! We started off with some black construction paper and discussed what type of web we were going to make. Our choices were Orb Webs (which are circular) or Funnel Webs which would look more like a cage. Then we got to work with our Elmer’s White Glue. Then we added some really fun glitter!! Shook the box to spread out the glitter. And once they were dry, we hung them up! We also used webs to work on addition number sentences! In Literacy since we were working on poems this week, we made Spider Poems! The kids LOVED making these!! We also wrote down facts that we knew about spiders! It was really fun to have the students say their favorite facts that they had learned. We wrote these on circular lined paper and turned them into spiders to decorate our door!! We folded up the legs accordion style and ended up with some awesome spiders! Our last spider craft was making spiders out of 4 pipe cleaners and fun colored beads. And last but not least we culminated spider week by cooking up some spider webs! This was SO easy! First I brought in three cooking trays covered with parchment paper and grouped my kids. I gave each group a bowl of pretzel sticks and had them place them in a circle. Then all you have to do is heat up white chocolate in the microwave, spoon it into individual plastic baggies, cut a small hole in the corner and let the kids squeeze a web over their pretzels!! We finished our creations with some sprinkles and let them sit for about an hour!! Next week we move on to bats and owls!! Here is a sneak peak of my lesson plans for next week!! 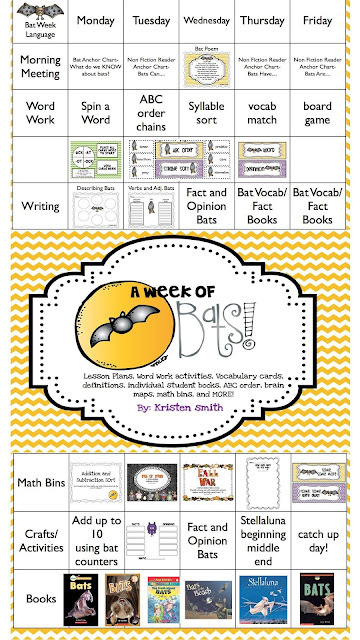 They are available at my TpT store with everything you will need for an awesome bat week!! Wow! That’s a lot of activities! How do you find the time for it all? I teach in a public school and we have to keep our regular content (reading and math) up and running in order to meet assessment timelines. Love all the activities! Jessica– We also have to keep our regular content of math and reading, too! This last week our focus in reading was poems and reviewing nouns, verbs, and adjectives so it fit perfectly in with the spider poems! We also have been learning the difference between facts and opinions in language. I precut all of the “craftsy things” so the kids focus on the academic part. This way, they are learning how to make a rough draft, check for the conventions of print and then we worked on our final copies of facts during our writing time. We have an hour every day for math. 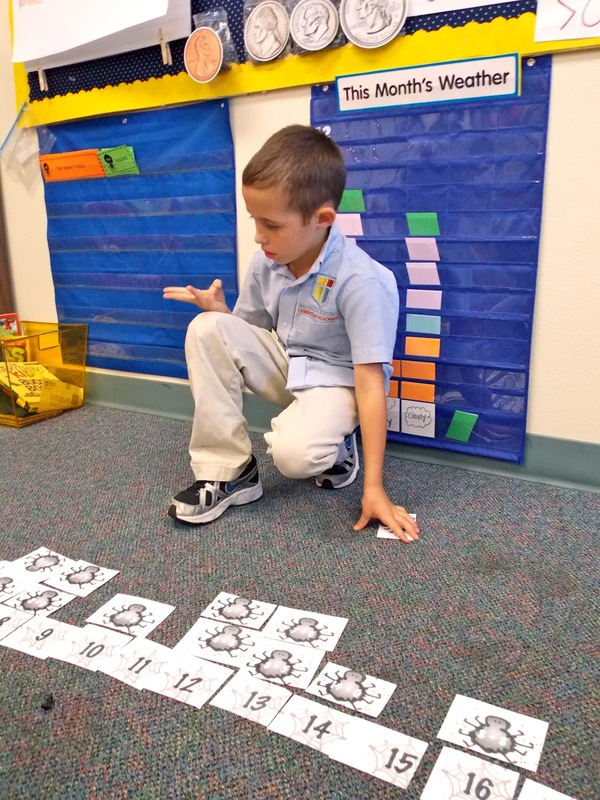 I use the first 5 minutes with a math activity to get my students ready for math. (spider addition, making numbers, patterns etc.) Then we move into a game. (number recognition, fact practice, greater than or less than, around the world), and then we have a mini lesson. After that we practice our cross calls (where we count by 2’s, 5’s, 10’s with our bodies), and then get ready for independent practice, math bins, guided math lessons or assessments. During this time they complete their math work for the day, I work in small groups with my kids, assess students and then they take their math bin for the day. Also, we start our day with a morning meeting and that is when we accomplished the anchor charts and 5 brief mini lessons on spiders. (spiders can, have, are; what do we know, want to learn, what did we learn) And on top of all that every day we have 30 minutes for Science and Social Studies at the end of the day. This week we focused on Science. We alternate our weeks for our units in Science and Social Studies. Friday is our Science experiment day in which I mark out 30 minutes for an activity every week. This week was a “cooking activity week.” They sure love this time!! I hope that helped!! If you have any other questions, email me at caseybean4@gmail.com!! I LOVE this post! There is so many fun activities in here!! I think we will be giving the spider webs a try…just too cute! Thanks Annie!! 🙂 Post pictures!! I would love to see them!! Your kiddos sure look focused! Great job creating joyful learning! What an amazing week, Kristen! You’re an inspiration!